Whether you’re looking to buy a new home or looking to sell a home on, it’s always a good idea to know and understand what you yourself would look for in a property as well as others so if the need ever arises for you to move out you can set up your home with the essentials it needs for an easy, hassle free sale. Gocompare recently released the results of a survey in which they asked their users to pick their most sought after features when they are searching for a property to buy. The results are as follows. 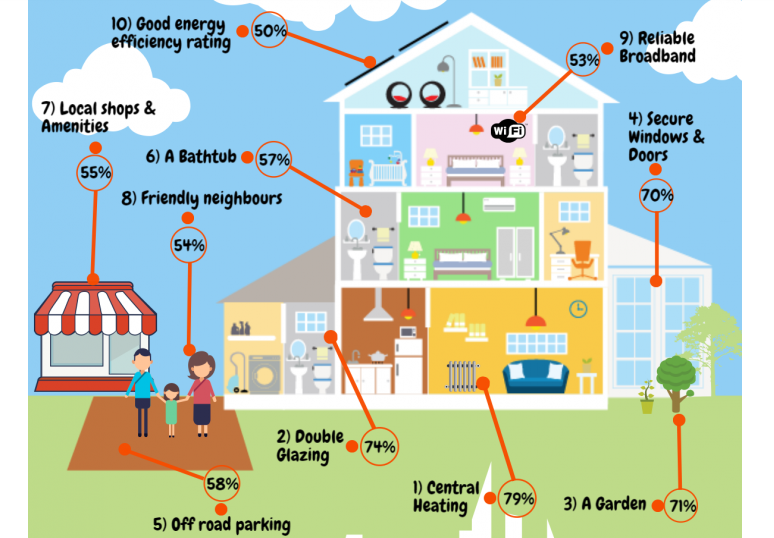 As we can see from the infographic above, in the top 5 alone we have 3 features that relate to energy efficiency and security alone (central heating 79%, double glazing 74% and secure windows/doors at 70%. This suggests homeowners value safety and warmth more over other things. Also in the top 10 which may be a little surprising to some is homeowners like to have the option of reliable broadband in their home. Saying this, given the times we live and how everything is slowly making its way online, this does seem fairly accurate. 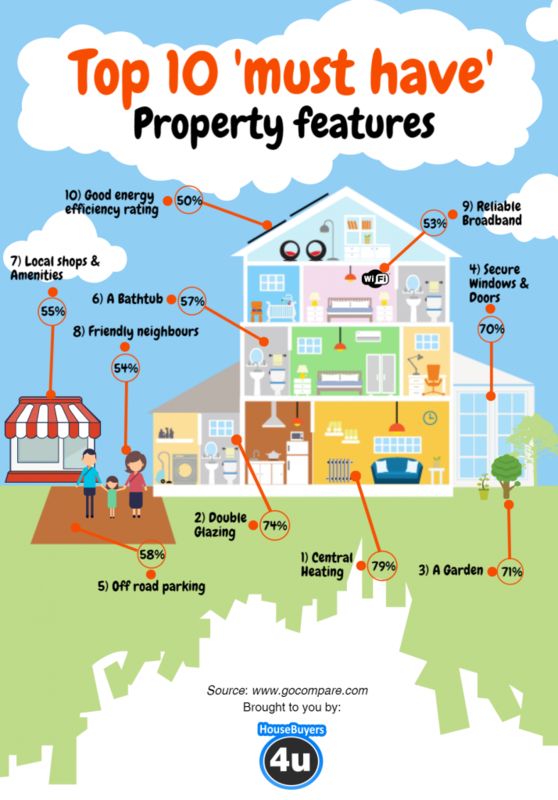 You can find the full list of the top 20 ‘must have’ property features conducted in the survey below. The top 20 results further suggest that homeowners in our day and age value energy efficiency as we see cavity wall insulation as the 14th must have on the list. Furthermore, bathrooms and toilets are very important to people who are looking to a buy as we see them on as 3 different property must haves appearing on the list, (A bathtub (57%), at least 2 toilets (45%) and en-suite bathroom (34%). To conclude we can say there are 4 main areas which most homeowners prioritize when looking to purchase a new home and these are, energy efficiency, safety, a nice neighborhood/close amenities and hygiene facilities.